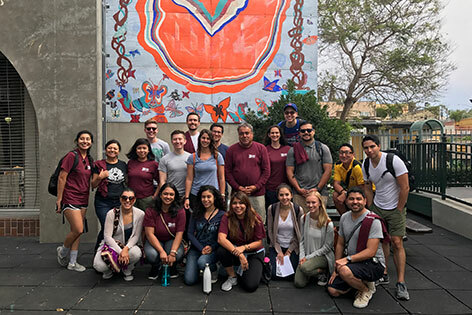 Members of UCI's PRIME-LC residency track gather at a mural near the U.S.-Mexico border during a recent trip to learn about the needs of immigrants. Residents in the Department of Family Medicine’s PRIME-LC track recently visited the U.S.-Mexico border to work with the Border Angeles, a nonprofit immigrant assistance organization. The annual trip provides our residents with an up-close, personal experience, giving them a better understanding of immigration issues and a sense of where many of the patients in our own clinics began their journeys. Our team visited a local day labor camp on the U.S. side of the border, where they met many undocumented immigrants and learned about the challenges they face. There, our residents helped the Border Angels group provide basic health information to the migrants. The trip also include a visit to Friendship Park, a small area just across the border with Mexico where U.S. Border Patrol conducts its activities. The park allows residents on both sides of the border fence to meet. In addition, residents visited the Border Angels headquarters in San Diego as well as Chicano Park, an important historical site in San Diego's Barrio Logan area where numerous murals depicting the Chicano and Latino movements have been painted on park pillars. The experience with Border Angels and the people they serve reinforces the PRIME-LC Residency Track mission: to train culturally fluent family physicians who will become leaders in addressing healthcare disparities among underserved Latino and other minority communities.